There’s no place like home, Dorothy said. 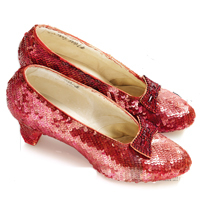 So when one of the pairs of ruby slippers that Judy Garland wore in “The Wizard of Oz” went on the auction block last December, we said in the magazine that we hoped someone would step forward to buy them for the new film museum that is a partnership between LACMA and the Academy of Motion Picture Arts and Sciences. “Moguls, get out your checkbooks,” we implored. And now comes news that some moguls have done just that. Actor Leonardo DiCaprio, director Steven Spielberg and former Warner Bros. chairman (and Yahoo! CEO) Terry Semel were among a group of “angel donors” who contributed to buy the shoes, which were valued by the auction house at $2- to $3-million (final purchase prices are not made public). How do we feel that our advice was heeded? To paraphrase the Cowardly Lion, Shucks, folks, we’re speechless.